I must have stared at this photo over 5 or 6 times in the past year when I tried to emulate this shot on a rainy day once. I have yet to top this portrait. All those comments! A one of a kind for sure. wow, whoever modeled for this is very cute! Great photo, love how you captured the true emotion AND the rain falling. Congrats on 2nd place, and for the Kodak picture of the day! Well deserved. Thanks, I hadn't tied the ad into the actual photo, thats funny. Congratulation on the Kodak Pic of the Day. And happy March 20! Technically brilliant - I am fav 207! could have sworn i already had this in my faves! it's a fab pic! I really love this shot a lot.. It's got a lot of mood and a story to tell.. lovely.. would have been a 10 for me.. Perfect for me.. This one is really so great! I love it. Great photo, the emotion you have captured is spot on. Just joined and noticed this on a friends favourites. Interesting to hear all the PP work - to a relative newcomer sounds complicated! I have nothing to sugggest improvement, so I'll just say that it reminds me of when my young daughters and I go "puddle hunting" in our rain boots. you know I have come back to this image time and again and the emotion it stirs within me I cant explain... there is raw energy a caged rage that is let loose and freedom pouring from the page. I'd print this and hang it on my wall .. that is how much i am moved by it. This picture impressed me so much before I joined dpchallenge. The strong emotion led me to join and enter the challenge. Congratulations. Sorry so late, I just joined. I REALLY like this photo. It is very powerful. Wow! Wonderful work. Belated congratulations on you ribbon, well deserved. Congrats on your ribbon! Great shot. Great impact. Just love it! It makes my heart sing. Congratulations on the ribbon. Congrats on this refreshing shot. This is a great photograph, congratulations on your ribbon. It's just perfect. ERROR: 'A Fresh New Rain' is already in your favorites list. Message edited by author 2006-05-02 06:24:33. Strong and outstanding in every respect conveying the magic of the element water. Congratulations on your Red. Very dynamic position. Good emotion. I keep coming back to look at this picture... Just an excellent shot. Kudos. It's a fantastic image, but I think it's been spoiled by way to much sharpening. I think my favorite thing about this picture, is the "realness" you captured! I love this shot! Congrats on the ribbon. Very cool image the post is super! I love this photo. It is a new approach to the challenge. I like how you catched the rain and the face of the man. Congrats on your ribbon! great shot, I've always wanted to do some rain shots. Great photo and congrats on the RED! Congrats on your first ribbon! Not really 100% liking the strong halo aruond him but it´s not bugging me either but his expression is priceless. Good job! Well done! Great power and emotion in this image. This pic is still number one in my book. Great shot! that's a great shot! congrats on your ribbon! This picture has a lot of energy. I like it. Congratulations on the ribbon and the perfect photo!!!! Congrats on your ribbon for this excellent shot. Good job! Need to learn to do those things in PS. The colours are wonderful too. Wow, thanks for the tips on bringing out rain... I'll look this photo up when I want to enhance some similar shots in our rainy summer in the UK! Congratulations on your red ribbon! I'm very pleased for you! And thank you also for your generous comment to me! great shot, congrats on the ribbon. This picture is stunning Joe!!!!! Message edited by author 2006-04-26 05:00:23. Congratulations - what a really great shot, you've captured his expression fantastically. A well deserved ribbon, and thanks for posting the pp info. This is a sensational shot...congratulations on the ribbon. You overcame the dnmc simply by using a fantastic title. I love the mood you created...well done Joe! That 50mm is a legend lens isn't it? Super image, got to love the rain. Congratulations on your first ribbon Joe! Wonderful image! Excellent, excellent photograph. Like the end of a movie. I saw what looked like oversharpening of your friend, but it looked intentional to me and it's used to really good effect. What a fantastic composition. I love the lines and the flow of light. Great stuff! Wonderful! I'm glad the haloing didn't hurt this shot. It's a fine, fine image in every other respect. Congrats on ribbon! Fantastic! Congratulations on a great shot and the ribbon! Congratulations Joe. One of my top5 faves from the challenge. wtg! Deserved the ribbon - so does your model for being such a good sport :) Wish I enjoyed the rain that much. Congrats on your ribbon winner! I'm glad this did well. Really a refreshing image (no pun intended) Congrats. This is a superb image and a favorite. Excellent shot! 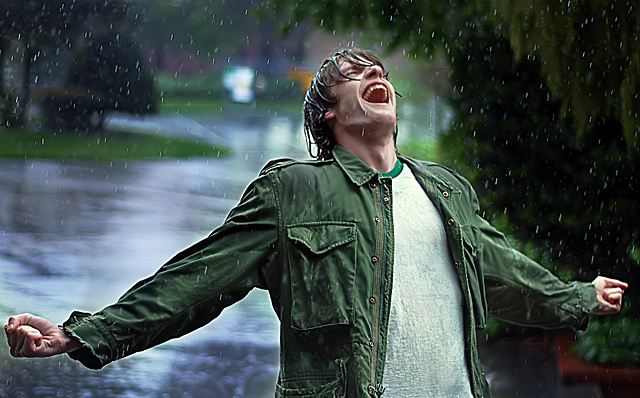 Where did you get the crazy person to stand out in the rain and love every minute of it? Haloing from post processing is detracting from this fine shot. Good idea and well captured. It looks quite natural and not posed. The rain brings in a lot of impact as well as the guy's wet hair. It is oversharpened somewhat however, especially when looking at the tell-tale oversharpen-aura around the guy's sleeve and hand on the left hand side. This is an excellent and fabulous happy image. Great expression and depth of field. Nice composition. Too bad about the sharpening halos. This image is great! To me, this is a nice, different take on the challenge and a good photo, as well. It does look like there's some halo effect around the subject, maybe from oversharpening a little? Other than that, very good. Excellent. The emotion of the pose caught me immidiately. Hoping this for a high placement. Love the pose, the expression. I relate to rain as "fresh", too, so that works very well. Not sure how you ended up with a bit of a green halo around the one hand, but it's a nit and not significant to me. Well done. How long did your poor model have to stand out there in the rain to get this shot? Well captured expression and stance that portrays a definate energy. Love the raindrops too! Wish I could join in ;-). Great job but looks just a little over-sharpened. Great composition and idea. the visibility of the falling rain really makes the photo. Very nice! This really came together well. I think it's got the full package. Congrats. I really can appreciate the crispness and clarity of this shut. Simple concept, but something about this photo really speaks to me. Great capture 8. I only wish I had thought of this! GREAT shot! LOL Isn't rain always fresh new? I like it (your photo that is). This is refreshing ... good work. Love this. The greens are wonderful. Unexpected. Outstanding shot in every way!!! Nothing less than a 10 would do, and added to my favs. Proudly hosted by Sargasso Networks. Current Server Time: 04/21/2019 02:44:54 AM EDT.